As usual, I’m having a giveaway to celebrate! And this year I can finally use my own books as prizes. 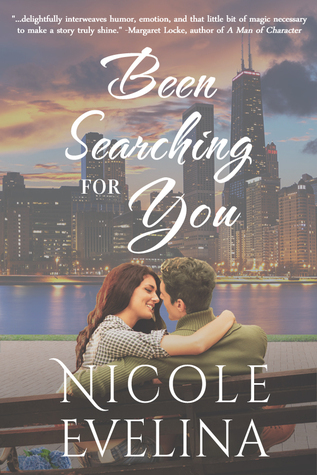 So if you go over to Goodreads by June 21, you could win a copy of Been Searching for You, my new contemporary summer beach read (US only – sorry but the international postage is a killer). Giveaway ends June 21, 2016. I can’t believe all that has happened in five years. When I started here, I was an unknown writer with no credentials and my first completed manuscript. Now I’m three-times published (soon to be four!) and have won multiple awards. It’s amazing how a lot of hard work and a little faith can pay off. Thank you to everyone for your support, whether you’ve been with me from the beginning or have just joined. There’s no way I could keep this up without you. Here’s to five more wonderful years. I’ve got plenty of books in my head, so if you stick with me, I promise many more historical adventures to come! Hi Nicole. I just stumbled across your blogiversary post after reading a milestone post for someone new I began to follow during the 2017 A to Z Challenge. Please accept my hearty congratulations not only for five years of blogging, but for launching your publishing career. I know what you mean about many books in your head. I actually have several manuscripts in various stages of completion, but still looking for the one to get everything kicked off. This year I am laying out the plot of a new historical fiction novel over my 26 A to Z posts. I’d love to have you stop by. The Steel Horse Saviors is a story about three civil war veterans who head west in 1866 with their Steam Locomotive to seek their fortune. They encounter a beautiful redhead trying desperately to save her family business that threatens to complicate their plan to escape their past.